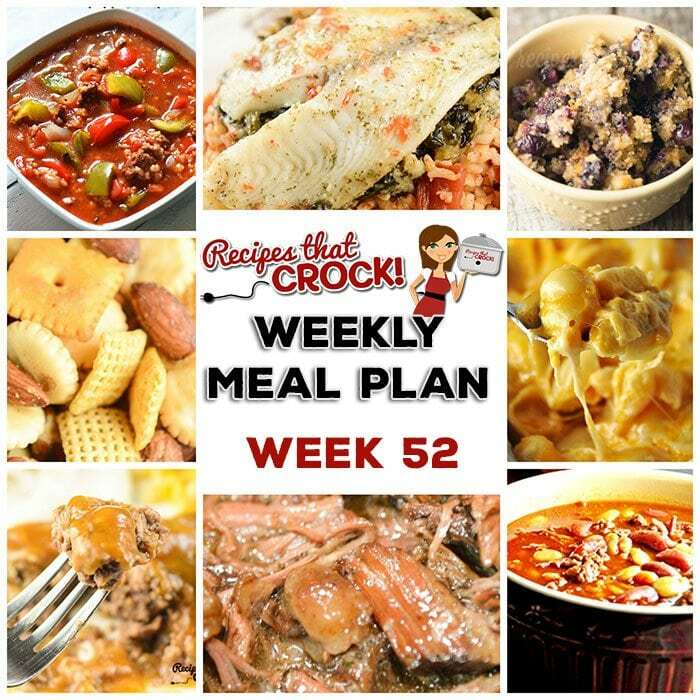 Meal Planning: Weekly Crock Pot Menu 52 - Recipes That Crock! This week’s weekly menu features Crock Pot Mississippi Beef Roast, Crock Pot Salisbury Steak, Cheese Lover’s Crock Pot Shells, Slow Cooker Stuffed Pepper Soup, Slow Cooker Pork Roast French Dip, Crock Pot Cowboy BBQ Beans, Crock Pot Tomato Rice with Stuffed Tilapia, Crock Pot Apple Spice Dump Cake, Crock Pot Blueberry Breakfast Casserole and Smoky Crock Pot Chex Mix. Cris here. We had a blast with last week’s menu. Since this week is a special week…ONE YEAR of meal plans…we thought we would do something special for you! We took the results of the survey and put together a menu with YOUR favorite recipes!